Discovering new features on the ocean floor, predicting the path of a tornado long before it formed, and enhancing the efficiency and safety of our nation’s ports: these are just a few of NOAA’s many notable scientific accomplishments from the past year. 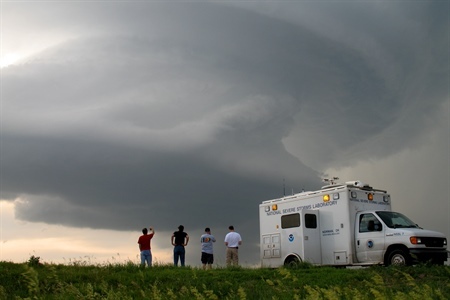 Researchers from NOAA's National Severe Storms Laboratory in Norman, Okla. watch the approach of a storm cell by their mobile command vehicle. NSSL is developing the Warn-on Forecast model, which shows promise at identifying likely tornado tracks hours in advance. In 2017, NOAA research aided emergency response efforts across the country from wildfires in the western United States to hurricanes in the Gulf of Mexico and Atlantic Ocean. NOAA’s science also resulted in significant advances in weather forecasting, improved fisheries management plans to ensure productive fisheries for years to come, and helped develop methods to improve U.S. aquaculture production. 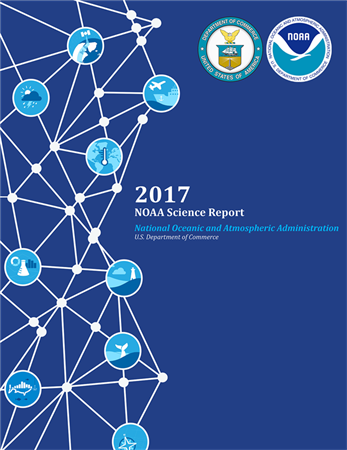 The 2017 NOAA Science Report celebrates NOAA’s research and development accomplishments and highlights how NOAA’s research products impact the lives of all Americans. The NOAA Science Report is pided into four sections: (1) Introduction, (2) Theme Chapters (3) Bibliometrics, and (4) NOAA’s Scientific Workforce. The Introduction defines NOAA’s research portfolio, answering questions such as why NOAA invests in research, what kind of research NOAA supports, where NOAA invests in research, and how NOAA transitions research into operations, applications and helps enable commercial uses. The Bibliometrics section of the NOAA Science Report measures the productivity and impact of NOAA science in major research areas across the agency. Between 2011 and 2016, NOAA authored or co-authored 11,475 publications and more than 90 percent of the articles published have been cited. In comparison to other federal agencies, NOAA has the highest productivity in the fields of meteorology & atmospheric sciences, marine & freshwater biology, fisheries, and oceanography. 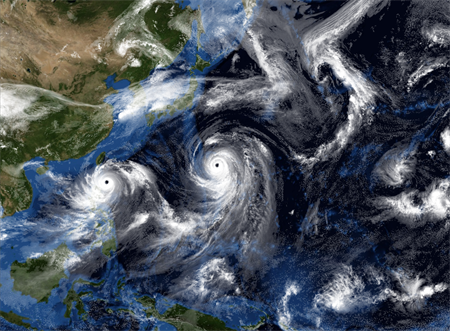 NOAA's new global forecast model will improve the skill of mid-range forecasts of events like these typhoons in the western Pacific Ocean. The final section of the NOAA Science Report, NOAA’s Scientific Workforce, highlights the creative and vibrant workforce that is at the core of NOAA’s research and development, and mission services enterprise. Between 2016 and 2017, the agency had over 580 individual and team accolades from internal and external entities.